quarrygirl.com » Blog Archive » daiya vegan cheese now at kay ‘n dave’s in culver city!! you know what this means: go eat some daiya-covered mexican food and prove that there’s a demand. hell yes, i’m talking about cheesy enchiladas, burritos, and tacos. the kitchen at kay ‘n dave’s is lard-free, and there’s already a vegetarian section on their menu, so have at it! just remember to specify daiya and hold the sour cream. the food at kay ‘n dave’s is amazing, and they have a good selection of beer, plus a full bar and happy hour everyday from 4-7pm! GO THERE! vegans deserve mexican food covered in cheese, so i really hope this little experiment is successful. 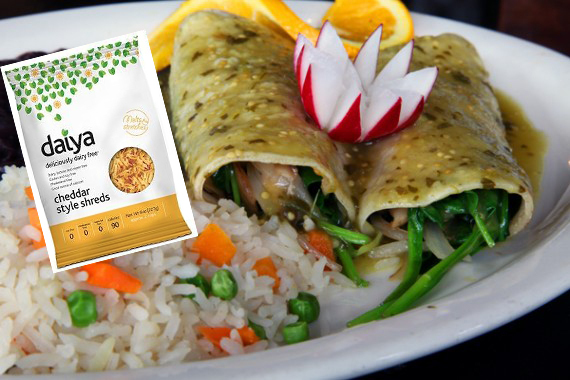 Love the way you photoshopped in a picture of a Daiya package rather than using a stock photo of a non-vegan burrito like those pricks at Veg News would. is it me or do they NOT have their hours posted ANYWHERE on their website! bigest pet peeve restaurants that don’t have their address, phone, and hours ON THEIR GODDAMN HOMEPAGE! Prices are not posted, either…. Yep, quite a contrast to Native Foods’ excellent website! Do you mention Native Foods because this place is right next door to Native? Haha. Can’t speak for anyone else, but my partner and I actually might try the Kay ‘n Dave’s in Culver City sometime, especially since some of the vegetarian plates do sound good, AND because the atmosphere at Native Foods was less than pleasing the one time we’ve eaten there. However, the FOOD at Native Foods is really good, and it IS an all-vegan restaurant, which does set my mind more at ease as far as the possibility of contamination, etc.